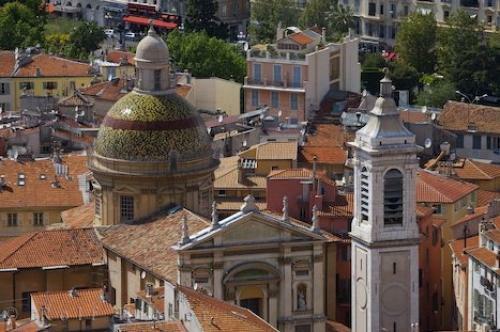 The rooftops view from the Parc du Chareau includes the ceramic dome and bell tower of the Cathedrale Sainte Reparate in the Old Town of Nice, Provence in France. The Parc du Chateau overlooking the city of Nice on the Cote d'Azur in Provence, France is a lovely, peaceful place to visit. There are a few ways to reach the top - the easiest - take the elevator, but for the hardier souls there are steps from the Quai des Etats Unis, 213 of them to the Naval Museum's observation tower and even more to get to the top of the Parc du Chateau. To view the rooftops and the Cathedrale Sainte Reparate in the Old Town of Nice, the Rue Rossetti leads up to the Parc du Chateau. The beautiful ceramic tile dome of the Cathedrale glistens in the sunlight and the elegant entrance, ornate columns and statues pay homage to the young Palestinian martyr after whom the Cathedrale Sainte Reparate was named. The bell tower, built in the 18th century and the red-tiled roofs of the Old Town of Nice, Provence completes the delightful view from the Parc du Chateau. ... the wonderful views and outstanding scenery of the city of Nice on the Cote d'Azur of the Mediterranean Sea, there are other things to see and do in the Parc du Chateau. Roman ruins, a playground for the children, a park with many flowers and the restful sight and sound of a waterfall. City of Nice and the Cathedrale Sainte Reparate in the Old Town, seen from the Parc du Chateau, Riviera, Provence, Cote d'Azur, France, Europe. I photographed this photo with the digital SLR camera model Canon EOS-1Ds Mark II, aperture of f/6.3, exposure time of 1/250 sec. on ISO 100, as always I used a original Canon Lens, the focus lenght for this picture was 220mm.